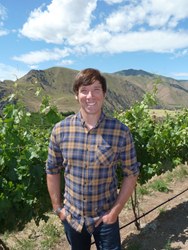 Acclaimed Pacific Northwest Winemaker, Garrett M. Grubbs, has been hired by Noviello Vineyards, a family owned boutique winery in Chelan, Washington, as it's Head Winemaker. Garrett brings tremendous passion and a wealth of knowledge and experience of all aspects of the wine industry to Noviello Vineyards. In 2008, Garrett landed his first job in the wine industry with Karma Vineyards in Chelan, eventually becoming assistant winemaker and manager of the winery, tasting room and restaurant. In addition, he has held positions as assistant winemaker at Swiftwater Cellars in Cle Elum, Washington and Brian Carter Cellars in Woodinville, Washington. Garrett most recently achieved the position of winemaker and manager at Plain Cellars in Leavenworth, Washington. Garrett has won significant notoriety for his winemaking skills. His wines have won numerous Platinum, Double Gold and Gold medals in regional competitions and have been ranked in the “Top 50” wines of the year by The Seattle Times and “Top 100” wines of the year by Great Northwest Wine. Garrett has mentored with numerous leading winemakers, including Ray Sandidge of C.R. Sandidge Wines in Chelan, WA, Brian Carter and Robert Takahashi of Brian Carter Cellars, Linda Trotta from Gundlach Bundschu of Sonoma and Tony Rynders, formerly of Domaine Serene in Willamette Valley, Oregon. He received a Business Marketing degree from Central Washington University and an Enology Certificate at Washington State University in 2011. Noviello Vineyards was founded in 2014 in Orondo, Washington by Dr. Fredric and Ana Stern with the goal of creating finely crafted wines, combining Old World winemaking styles with New World techniques and reaping the benefits of the bounty of one of the best wine grape growing regions in the country. Noviello Wines have won numerous national and regional awards, including Silver and Bronze medals at the 2016 San Francisco Chronicle Wine Competition, and Double Gold and Silver Medals at the 2016 Seattle Wine Awards.